Lily is unhappy about being implicated in the crime. Two of last year's pumpkin's offspring had turned orange so today, armed with a pair of garden clippers I cut them of the vine. In a controversial move, I climbed my pile of composting leaves to nab the pumpkin dangling on my neighbor's side of the fence. That one's pictured at top left. Look at how cute they are on my stoop. I'm not proud of the move. But, if it's any consolation to those who would have me tarred and feathered, in an act of instant karma, I lost the garden clippers. 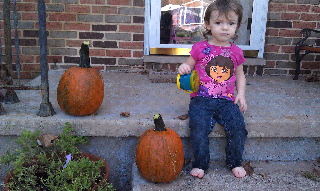 I've retraced my steps from the pumpkins to the front stoop three times and haven't found them. Also, my right eye hasn't stopped itching since the pumpkin confiscation. What more pestilence will this ill-gotten pumpkin rain down on our household through the month? I shudder to think. 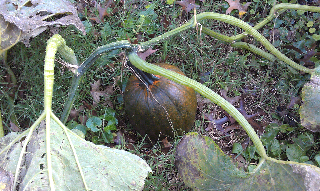 I did leave the still-green third pumpkin in the neighbor's yard -- hoping they will see it as a gift and/or consolation prize of sorts. See. I'm not a total criminal.